Continuous Compound Technology for improved mileage allied to increased grip when leaned into corners. Traction Skin all but eliminates the scrubbing in process thanks to micro-rough surface on the new tyre. Sports Touring ‘Black Chili’ compound gives fast warm-up and confidence inspiring wet road grip. GT versions optimised for heavier bikes and extra durability. 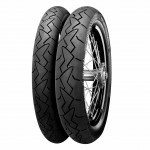 New 18 inch sizes to bring the latest radial technologies to classic bike riders for the first time. Special V speed rated versions for big adventure bikes that never go off road. 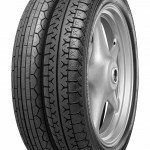 Classic line of tyres with traditional tread designs and neutral handling. Circumferential grooves give good stability. 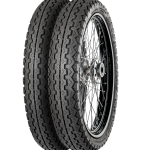 Ultra modern radial tyre technology for classic machines. 0° steel belt radial technology delivers hugely improved high speed stability and braking confidence over bias-ply tyres. 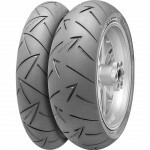 Traction Skin’s micro-rough tread surface minimises tyre break-in, improving rider safety when the tyre is new. ‘Black Chili’ compound combined with Continuous Compound Technology delivers high durability as well as previously undreamt levels of corner grip. Unique tread design optimises tread stiffness for agile handling and also ensures excellent water evacuation in wet conditions. Suitability for tubeless and tube type fitment.